You are at:Home»Ireland»Ireland Women»Women Six Nations»Women 6N: Teams up for Ireland v England. Mclaughlin and Dane in action for Ulster against Connacht. The teams have been announced for Ireland Women’s opening Six Nations international, against England Women, which takes place at Donnybrook on Friday 1st February, kicking off at 17:00. Ulster Women and Old Belvedere players Claire McLaughlin and Kathryn Dane have made the squad, as replacements. The squad is made up of three from Munster, four who are Exiles, five from Connacht, nine from Leinster and the 2 Ulster players. Six out of the seven All Ireland clubs are represented in the squad along with four Premier 15 teams. Kathryn Dane is included in the squad for the first time but it’s well overdue for the Enniskillen native who impressed last season in the AIL for her team Old Belvedere who she’s played for since moving to Dublin for college. McLaughlin, who moved to Old Belvedere this summer to enhance her selection prospects, has been selected as back row replacement a new position which she trialled for Ulster Women in this seasons Inter-Provincials. Speaking of her possible appearance in the back row against a strong English side, Claire told The Front Row Union. 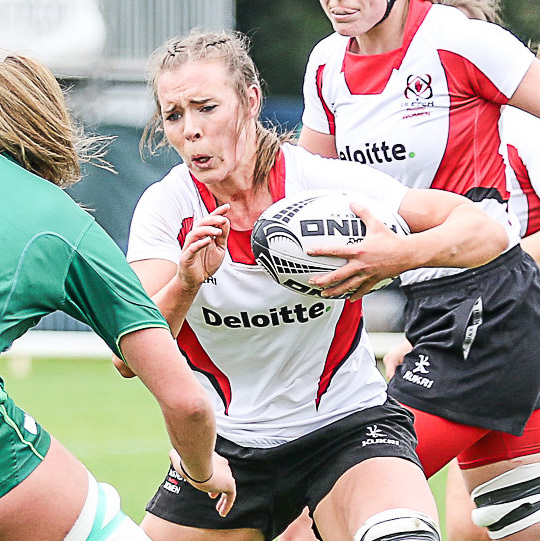 Ulster’s Claire McLaughlin in back row action against Connacht. I’ve really enjoyed the transition to back row – I’m so glad Suff [Ulster Women’s coach Derek Suffern] threw me in there with Ulster during the interpros. The coaches and girls in Irish camp have been great in getting me up to speed – it’s been a steep learning curve getting to grips with lineouts and the technical bits at number 8, but I’m absolutely loving the challenge, and can’t wait to get stuck in during the Six Nations! Also of Ulster interest is the inclusion of former Ulster Women’s Players Laura Feely in Ireland’s front row and Poppy Cleall who features in the English second row. Both played for Ulster Women in 2011 including this exciting game against Munster where Feely made her Inter-Provincial debut I believe. The squad features two other new starts with in-form Old Belvedere forward Linda Djougan and Connacht’s Anne-Marie O’Hora joining Dane and McLaughlin in the replacements. The highly rated Alison Miller also returns to the squad after a year off with injury. It’ll be a tough game for Ireland against the now fully professional English side and, with the gulf between England and France and the rest of the Six Nations sides expected to widen over the coming seasons, this could be the last chance for Ireland to be reasonably competitive against Europe’s top sides. France have decided to elevate their sevens side to secure qualification for the 2020 Olympics and are missing some big names for the game against Wales but England have no such problems, naming the best side available. This has involved wheeling out their big guns with , 2014 Rugby World Cup winners, Sarah Hunter (108 caps), Katy Daley-Mclean (102 caps), Emily Scarratt (74 caps) and Marlie Packer (61 caps) all starting.